As WQED Multimedia Pittsburgh’s director of programming and host of QED Cooks, Chris Fennimore wears many hats (and occasionally an apron) at the station. Since 1991, the Brooklyn native -- who joined WQED Multimedia in 1985 as Director of National Programming -- has served as Director of Programming. In his current position, Fennimore is responsible for selecting and scheduling all television programs that air on WQED tv13. He was also formerly a food columnist for PITTSBURGH magazine. In August 1993, Fennimore incorporated his own love for cooking with his responsibility for providing quality television programs -- and inaugurated the cooking marathon format with "Zucchini Cheesecake." Since then, he has produced -- and hosted -- more than 50 live cooking marathons, ranging from "A is for Appetizers" to "S is for Seafood." Public television stations across the nation now copy this extremely successful fundraising formula, although no host is like him. His endearing style and down-to-earth demeanor has made him a household name in Pittsburgh cooking circles and across the country. 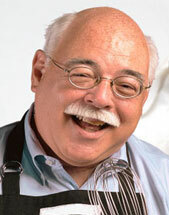 Fennimore became a weekly presence on WQED in 1996 when he launched QED Cooks as a half-hour series featuring segments from the cooking marathons.